I rate my trips based on the contentment of my stomach. 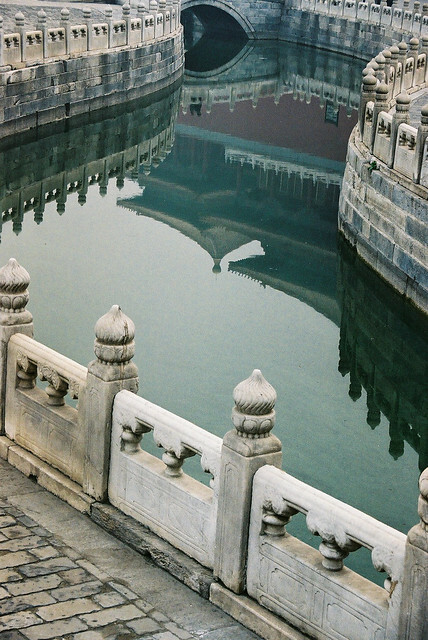 I dragged the hubs on a month long backpacking adventure to China a decade ago covering Guangdong, Guizhou, Guiyang, Sichuan and our final stop, Beijing. We ate mostly at local restaurants or little hawker carts by the roadside. No trip to Beijing was complete without a taste of Peking Duck (or otherwise known as Beijing Roast Duck these days). I was beyond excited about this restaurant which I was told to go because they served incredible Peking Duck. We queued up along with dozens of other locals. The queue was out the door, spilled into the streets and around the corner. 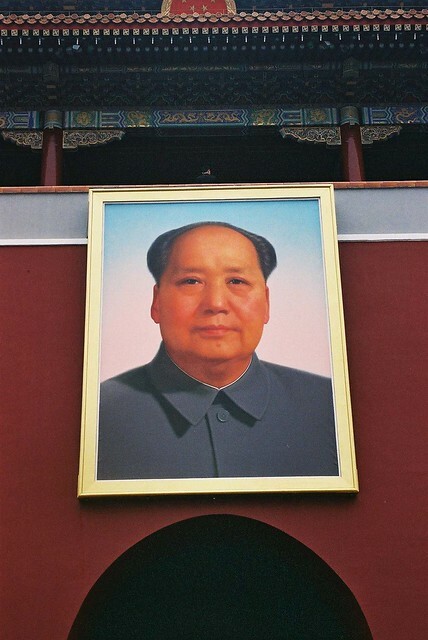 I was lucky enough to pass as a local from the south but the poor hubs who has a thick Kiwi accent was told he was a xiang jiao (banana) by Beijingers - yellow on the outside, white on the inside. He spent the rest of our (okay, mine) amazing culinary experience being gawked at like an odd circus specimen. Poor dude. I've had many Peking Ducks since but none came close to the one we had in Beijing. 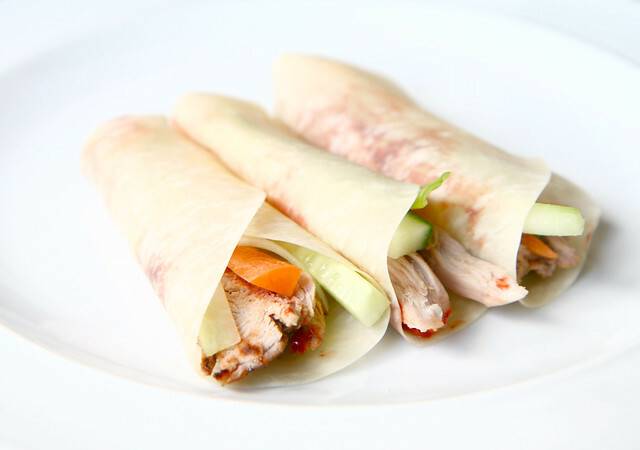 A variation of the Peking Duck has been in existence since the 13th century and was enjoyed by the Emperor as well as the upper class. It wasn't until the founder of Quanjude restaurant in Beijing developed the hung oven to roast the ducks in 1864 that contributed to the popularity of the Beijing roast duck. 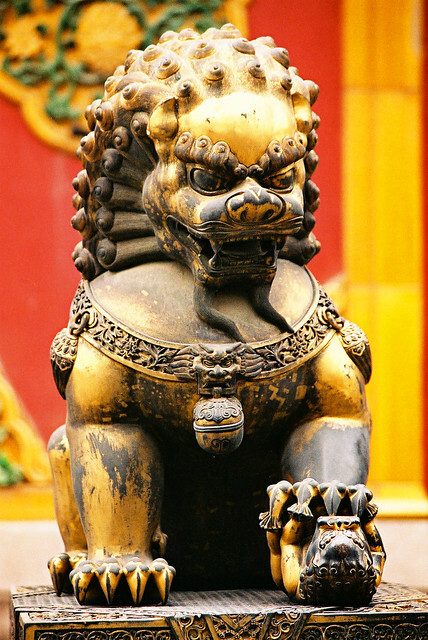 Furthermore, the fall of the Ching dynasty in 1911 enabled many Forbidden Palace chefs to set up their own restaurants that finally allowed the general public to enjoy the dish. The Quanjude chain must doing quacking well seeing that they sell well over 2 million roast ducks annually. The company is valued at slightly over US $1 billion. The ducks used for this type of dish is actually from a variety called Pekin duck which originated in Nanjing. The preparation is extremely complicated which involved blowing hot air into the duck to separate the skin from the fat. The duck is then boiled, hung, glazed and then roasted. Whew! Seeing that I'm not a chef nor am I inclined to spend the next 48 hours trying to blow into the neck (ew!) and methodically going through all the different steps, I decided to create my own quick and easy version. This is a bit of a cheat and may not be completely authentic. Nevertheless, it was delicious. It also involves little cleaning up - music to all mothers' ears. Please note that I don't normally measure ingredients as I tend to guesstimate so increase or decrease to suit your taste buds. 1. Preheat oven at 200 degree Celsius. 2. Pop the duck onto a baking tray. 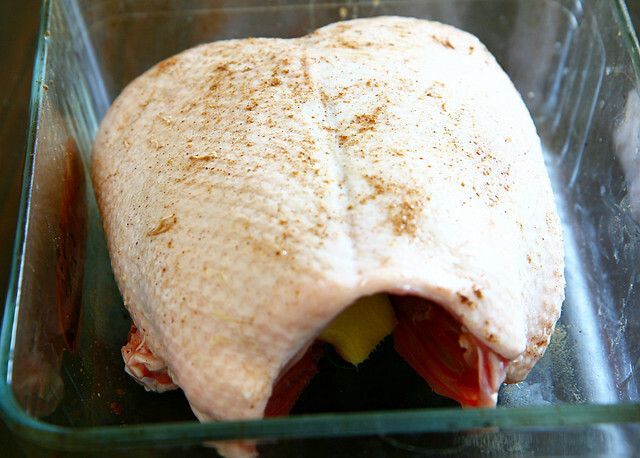 Rub five spice powder all over the duck and chuck the sichuan pepper and ginger into the cavity. 3. Mix all the basting sauce ingredients together. Take a brush and gently baste the duck. Cover the top of the tray with aluminium foil to prevent the skin from burning. 4. Roast the duck in the oven and continue to baste the duck every 10-15 minutes. It takes approximately 2 hours to roast a 1kg duck. Take a skewer and slide it into the meatiest part of the duck (breast) and if the liquid that spurted out is clear, the duck is cooked. Remove the foil and continue to bake for another 15 minutes till the skin is brown throughout. Remove from oven and let the duck rest for 10-15 minutes. 5. Using your fingers or tongs, remove the meat from the cavity. 6. Steam the pancakes. You can microwave them as long as you cover the pancakes to prevent them from drying out. 7. Slice the cucumbers, carrots and scallions (spring onions) into long thin strips. Scoop a couple of tablespoons of hoisin sauce into a small bowl. 8. Put a couple slices of duck meat and the accompanying vegetables and sauce on the pancake. Fold and eat. Oooooh I so badly want to eat this now! I can't believe you make that, I'm so impressed! I have been meaning to try this forever and I think you may have just inspired. I was going to ask what a scallion was but now I now. It sounds a bit more exotic than a spring onion. i haven't had this in years and its bringing back memories. this looks SOOOOOO good. AHHHH! xO! Me and Ben love duck and pancakes though I've never tried to make it myself. Err ... I do have Costco membership though and they do one that's not bad for £8-9 which I have been known to indulge in .... a few times. Makes for a cheap and fun night in with a few girls around! Oh and my husband just gets called "gwai lo" wherever he goes in Hong Kong and China. But he's pretty mean with the chopsticks. marlene, how many times must i tell you...you ARE a chef! hahaha i know this recipe is fabulous! i'm afraid to even try. haha so jealous you got to spend a MONTH there. with places like that, i feel it's necessary in order to comfortably see everything. good for you! hope all is well. WOW! I am DEFINITELY trying this ... and what beautiful pictures!! thanks for the sweet comment, your daughter is too sweet! YUMMY! 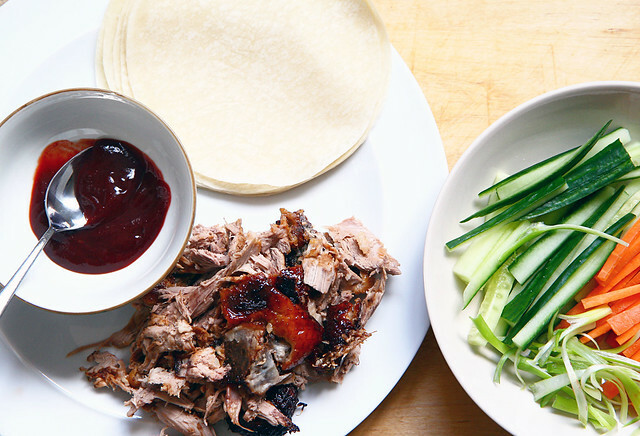 We are actually having this tonight, I'm so excited as I love Peking Duck! I've actually never tried Peking duck before because I usually stick to chicken, but it seems really good! OMG Peking duck is one of my favourite food of all time! Oh my god, love Peking duck. I used to eat it all the time when living back home. Your cooking skills are sure extraordinary, i dont think i have enough patience nor ability to roast a duck..let alone a whole chicken. Yummy!!! Oh WOW!!! This looks divine...I have never been brazen enough to try and make duck at home, but you make it looks so easy/breezy that I just may have to give it a go. Love the photos as well, makes me hungry!